This fixture was built for NASA and is used to rotate the shuttle’s main engines. 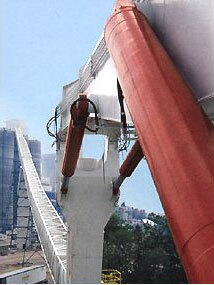 It is actuated by two, three-stage telescopic Sheffer cylinders which are capable of lifting a 300,000 pound load. Each cylinder has a total stroke of 25′ and a main barrel measuring 19″ OD. Sheffer’s Engineering department worked closely with NASA during the design phase and our Quality Assurance staff helped the space agency implement a special QC program. 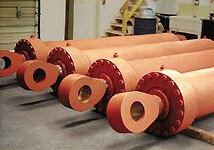 These custom cylinders are used to actuate a latch system on melt equipment in a steel mill located in the Northwest. 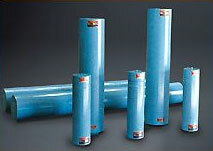 The cylinders incorporate high temperature seals and have an 11″ bore with 1″ stroke. A special engineering effort was needed to utilize the available space. 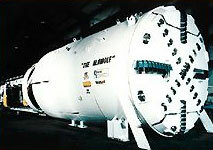 These 1, 5 and 10 gallon capacity accumulators were built for use on test equipment in a Texas oil field. Very smooth internal finishes and special high-pressure fluorocarbon piston seals provide minimum friction to assure long life. These three-stage, single acting, telescopic cylinders were built for a unique application in the pulp and paper industry: Lifting platform and semi-truck trailers to dump wood chips. The cylinders required deep hole boring and honing, and feature a 430″ stroke. Not only did they replace existing cylinders, but they also dramatically improved the service life. 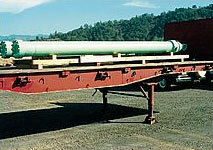 The logging industry is a heavy user of custom cylinders manufactured by Sheffer. These top-end log loaders count on the repeatability and performance of our cylinders to operate their loading equipment. 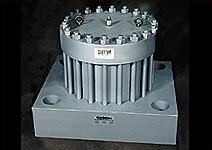 This cylinder used in geologic engineering is capable of exerting 3,000,000 pounds of pressure. Outfitted with a positioning device for stroke control, it has a 28″ bore, 4″ stroke, 47″ x 56″ x 14″ platen face plate and 5000 PSI operating pressure. The customer’s engineering department worked closely with our personnel to achieve the desired force and size requirements. Providing the force for trash compaction, these long-stroke, high duty cycle cylinders range in size from 14″ bore with an 11″ rod and 312″ stroke to 8″ bore, 6″ rod and 264″ stroke. The equipment manufacturer turned to Sheffer engineers to size the cylinders that required deep hole boring and honing. Sheffer went underground in the development of cylinders for this boring machine that utilizes 12″ and 15″ high pressure cylinders (5000 PSI) to grip and propel the unit. Sheffer’s experience was critical to manufacturing the cylinders using plated high-strength materials and special welding procedures for a long service life. 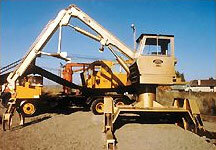 These two stage telescopic Sheffer cylinders are used on underground mining dump trucks with low overhead clearances. Sheffer engineers were called on to effectively use the limited space. The first stage of each cylinder is double acting, the second stage single acting. 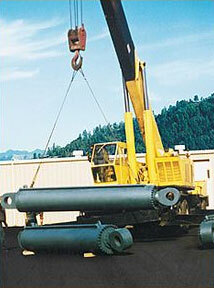 This special order involved manufacturing 14″ bore boom cylinders, 12″ bore jib cylinders and 8″ bore stinger cylinders, which were then mounted on equipment to unload bulk cargo on the Ohio River. Each cylinder was built to ABS specs and includes triple chrome plated cylinder rods and bodies coated with marine-grade paint. Lined up ready for shipment, these 18″ bore, 9″ rod and 120″ stroke marine cylinders are used for opening and closing a split hull hopper barge. To meet space and force requirements, the experience of Sheffer engineers was needed by the customer. 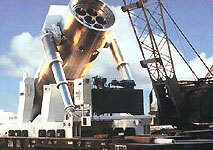 Special manufacturing procedures included deep hole boring, large/long honing, chrome-plated rods and marine paint. 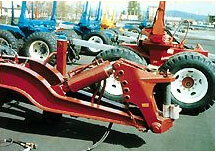 A necessity on trailers hauling extremely heavy loads, these custom hydraulic boosters manufactured by Sheffer are used to equally distribute load weights over the axles. The cylinders help assure over-the-road safety and extend the useful service life of the customer’s trailers. 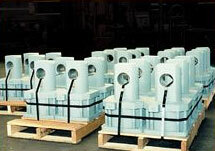 These 100% stainless steel cylinders produced by Sheffer help raise and lower the containment unit used in the rail transport of nuclear waste from Three Mile Island to its disposal site. Each five stage double acting cylinder had to meet a 4:1 safety factor and was subjected to extensive testing according to demanding certification procedures. The turnaround time was eight weeks from placement of the order to shipping date.